A hearing problem can have a very significant effect on a child’s educational development and language skills. Sometimes it’s not possible to medically treat the cause of the hearing loss and the solution to better hearing comes with the fitting of appropriate hearing aids. A key element of the hearing aid fitting is the custom made earmould that couples the hearing aid to the ear. It’s not uncommon for children with permanent hearing loss to be a little self-conscious, embarrassed or to think they may be teased about wearing their hearing aids, especially with their peer group. Any steps that can be taken to encourage hearing aid use are to be welcomed and applauded. This is why we set out, along with our partner Starkey Hearing Technologies, to devise a technique to insert a picture into the earmould at the development stage. This technique became revolutionary within the hearing aid industry. One of the most popular requests from children was for the Manchester United Football Club logo. So in May 2000 Manchester United Football Club were approached. And to everyone’s delight the club agreed and gave their 100% support to encourage youngsters who were Manchester United FC supporters to wear their hearing aids with pride. The reactions of the hearing impaired youngsters, who were the first to receive their Manchester United customised earmoulds, were absolutely incredible and the level of positive feedback was overwhelming. Not satisfied to stand still, Starkey and Arlington went on a quest to gain more support from other teams, whose logos could be added to their pioneering non-profit making procedure. And so the Better Hearing Initiative (BHI) was born. Since 2000, the BHI have worked hard to offer children Premiership football team crests, rugby union and league crests, as well as national teams such as; England, Wales, Scotland and Ireland. 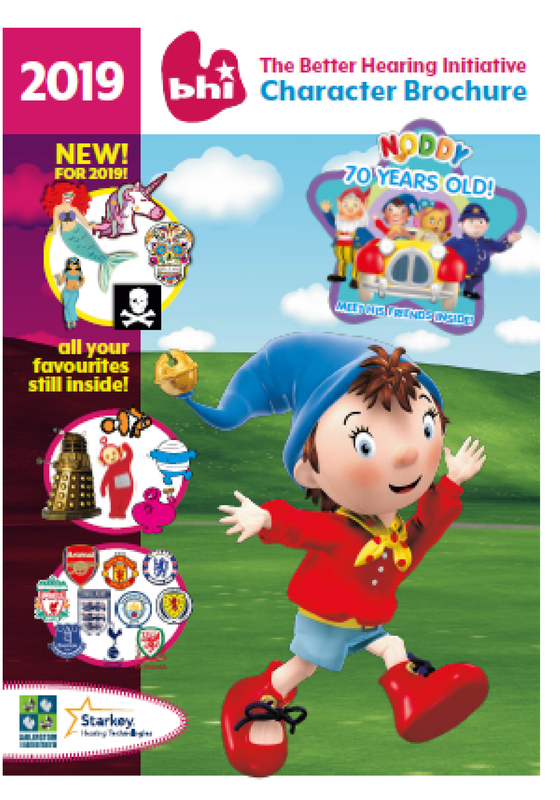 And for those who aren’t sports fans, BHI are excited to offer children the Bubblegum character range, all of the Mr. Men and Little Miss characters, BBC children’s characters Tweenies, Teletubbies, Fimbles and characters from Doctor Who as well as characters from Noddy. There’s also a wide choice of animals, vehicles and logos including the superheroes - Batman, Superman and Spiderman. Better hearing means better quality of life. And the Better Hearing Initiative compliments all of their supporters in their commitment to hearing impaired children. The BHI will continue striving to offer children (and adults) the logos they request and look forward to encouraging more hearing impaired children to be BRAVE and SMART in wearing their hearing aids with PRIDE.